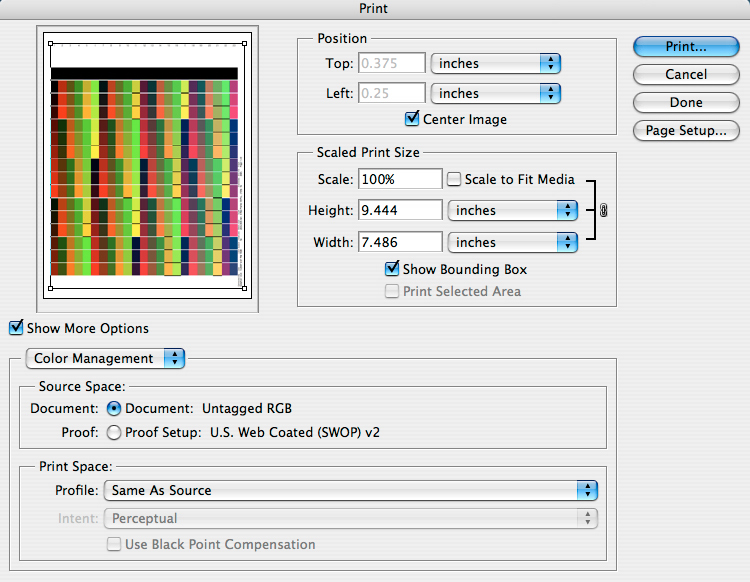 Before printing, make sure your printer is printing as you want it to print with the profiles that will be generated. Run any calibration routine the printer has, as well as any nozzle checks or head alignments. Make sure the machine is set on the media setting you want to use, be this setting at the front panel or in the print driver. 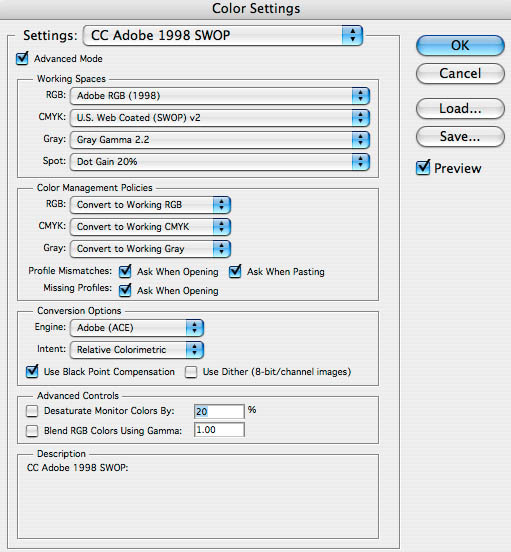 Make sure all image "enhancements" and color control "features" of your printer are turned off. Next, open Photoshop and find the color settings dialogue. Depending on version and operating system, it'll be under "Edit" or "Photoshop." Now alter your settings per this example. Some parts of this matters more than others to print the targets, but the keys are indicated as A and B. And above all the key is to make sure, by checking "B", that Photoshop doesn't alter the targets when it opens them. Click Leave as is, and open the image. This dialogue has been called a few things in different versions of Photoshop, and the settings have been given different names a few times, but this "Print With Preview" is the printing screen you want. What you're attempting to do here is to print to your printer in the best state it can be on for the media you're printing on with no interference from either the printer or Photoshop. Keys are to make sure the image is all on the page, that Photoshop hasn't resized it, and that you're printing the image with no color profile applied either to the image, or to the print space.